Find out more about Louis Edmonds -- and about "Big Lou" elsewhere on the web. • Read a review of Big Lou written by Stuart Manning, editor of the Dark Shadows Journal. You can also read Stuart's own brief bio of Louis there. • View Louis' acting credits on the Internet Movie Database. • Shop for Louis-related collectibles on eBay.com. • Find out about some of Louis' Broadway outings on the Internet Broadway Database. 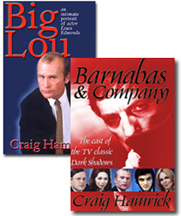 • See exactly which episodes of Dark Shadows Louis acted on, at Dark Shadows.com. • Read a brief bio of Louis at TV Tome.com. • Get a detailed description of Ernest in Love, one of Louis' off-Broadway triumphs, at Musical Heaven. You can also read about his Broadway debut, Candide, there. • Check out MSN Entertainment's page on Louis. • Louis' obituary is posted on Soap Central. • Dress up your computer screen with some nice wallpaper images of Louis at Portraits of Collinwood.com.